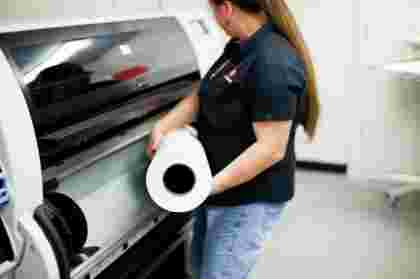 Secure unattended printing with high quality and high speeds. 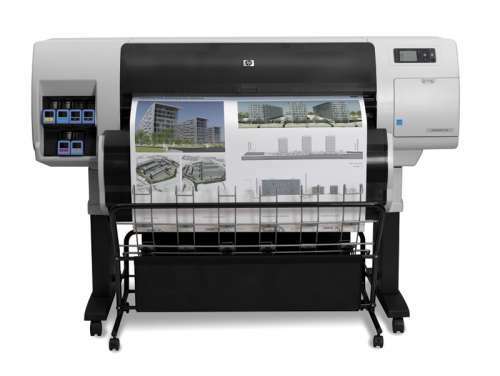 Enjoy high-speed printing: get up to 4 A1-sized prints/min with improved HP Double Swath Technology. Print confidently knowing this Designjet, with original HP-GL/2 and RTL, supports most CAD applications on a wide range of operating systems, and enjoy PostScript and PDF support. Enable unattended printing by high input/output capacity, with up to 3 rolls, an optional stacker for up to 500 prints and high-volume HP ink cartridges. Manage this printer effortlessly with HP Web Jetadmin, and experience trusted connectivity and security with built-in Gigabit Ethernet networking and embedded IPsec and IPv6. 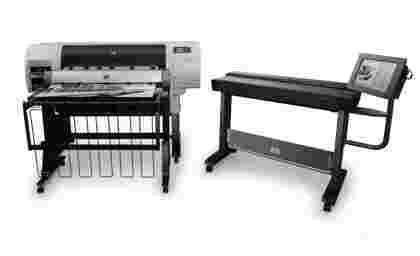 Easily add rolls to your printing system (from 2 to 3) with an upgrade kit, and load different media on each one. The HP Designjet T7100 can ensure your business never stops, with optional stackers allowing for increased input/output and HPs excellent Web Jetadmin software. Including support for most CAD applications as well as a wide range of operating systems, however your business is run this printer can keep services moving forward. The stacking systems allows for two rolls as standard with a tertiary available with the purchase of an upgrade kit. This further improves that unattended print capability but also flexibility of print media and volume. With a range of media types to print onto, the HP Designjet T7100 can produce a clean and crisp result on: bond and coated paper (bond, coated, recycled, heavyweight coated), technical paper (natural tracing, translucent bond, vellum), film (clear, matte, polyester), photographic paper (satin, gloss, semi-gloss, matte, high-gloss), self-adhesive (indoor paper, polypropylene, vinyl), banner and sign material (backlit, outdoor paper, blue back billboard paper) and more. The six ink printing system allows for clear and accurate renders, professional images and presentations to be produced with deep blacks and bright colours. Monochrome prints, such as those from CAD or GIS printers, can be produced at comparable costs to LED printers whilst providing a higher quality of print and flexibility. 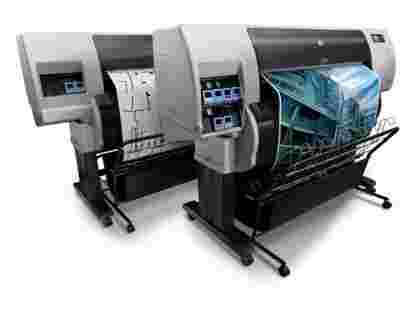 With high speed printing comes the need for increase stability and HP have this honed with their improved double swatch technology allowing for four A1 sized prints per minute all with crystal clear print quality and resolution.